Wendell's best season was 2001 with $8,025 for six events. Wendell�s best finishes were 2001 sevenths with Liz Masakayan Hermosa Beach and Muskegon) and Jennifer Pavley (Manhattan Beach). Wendell was a member of the United States National Indoor Team for five seasons and competed in the 1996 Atlanta Olympic Games with Elaine Youngs. 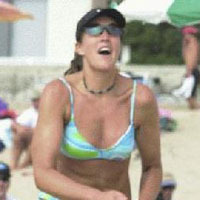 She played two seasons for the San Jose Storm of the Professional Volleyball League. Wendell lettered four season at Stanford (1992-95). She was the NCAA Player of the Year twice (1994 and 1995) and a four-time first team All-PAC-10 (1992-95). Wendell led Stanford to the 1992 and 1994 titles. She was also the 1990 USA Today Player of the Year.